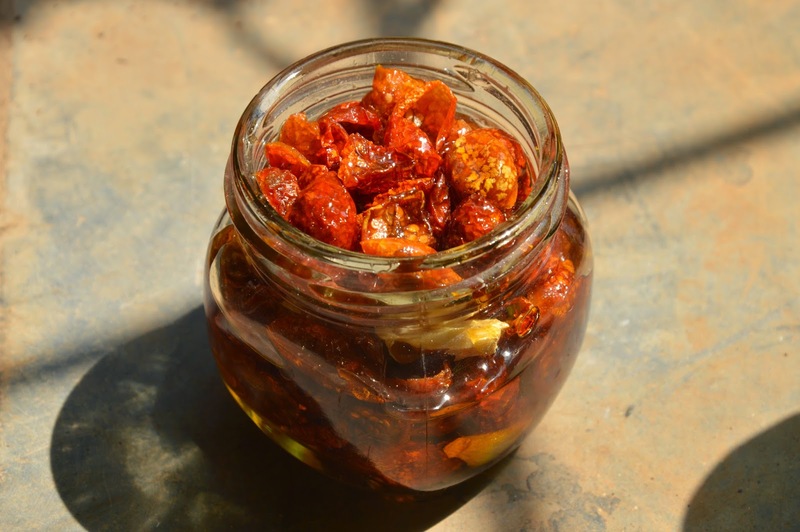 euphoRHEA: Sun Dried Tomatoes - Make them at Home! Considering how addicted I am to sun dried tomatoes and how often I make them, I'm surprised I haven't written about them on my blog. Well, it's never too late, is it? I first tasted sun dried tomatoes from a bottle that Saee sent over. She'd made them at home and had sent some over for the hubby. Neither of them expected me to like them, let alone even try them. But I did. And I fell in love. Sun dried cherry tomatoes preserved in olive oil with a few cloves of garlic is something you will always find in my pantry cupboard now. And I dry my own tomatoes, at home. They say a convert is always a greater believer and oh my God, I am! While the scorching heat has been getting all of us down, there are some benefits to having hours of blazing sunlight. A chance to dry tomatoes and stock up! It's a very simple process and if you carefully follow some basic guidelines and are patient you will soon have your own stock of home made sun dried tomatoes. Here's what you need to do. 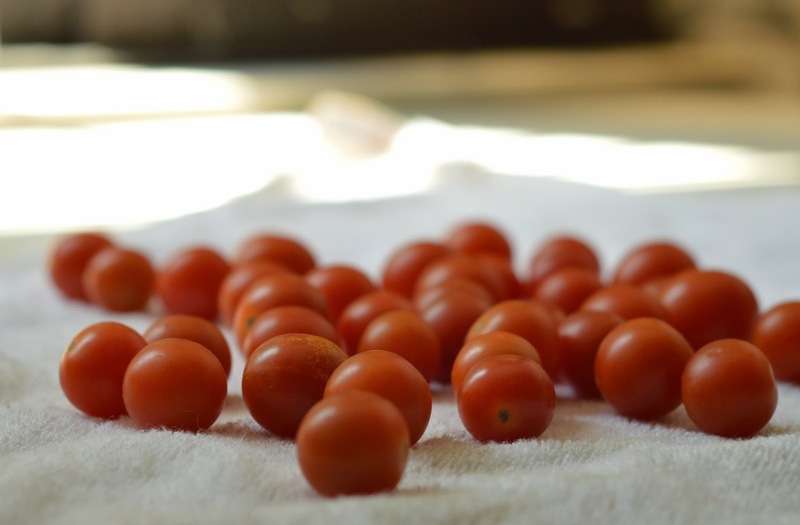 Buy firm cherry tomatoes. If they're squishy and over ripe they tend to get fungus while drying and your batch will be ruined. Wash and drain the tomatoes. Pat dry with a soft towel or tea cloth. Spread out to dry for half an hour or so. You want no extra moisture on the tomatoes. Halve the tomatoes into two hemispheres and then lay them cut side up on the tray. It's okay if they're a tight fit as long as they're not on top of each other. If space is short just use another tray or plate. Sprinkle the tomatoes with salt making sure you get salt on all the tomatoes. Put the tomatoes in the sun to dry. Leave them in the sun for two to three days till they completely shrivel up. Make sure none of them have developed fungus. Discard the ones that happen to get fungus if there are just a few. Cover the tray with a thin cloth at night to keep out insects. 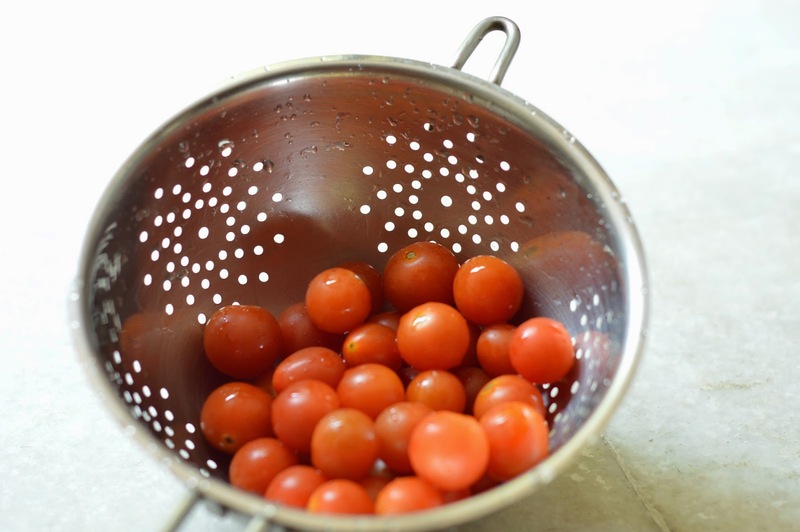 Don't use a thick cloth or paper - you want air to circulate through the fabric or the tomatoes might spoil. Once the tomatoes are dried completely put them into a jar along with a few cloves of garlic. You don't need to peel the garlic, just pop them in with the tomatoes. 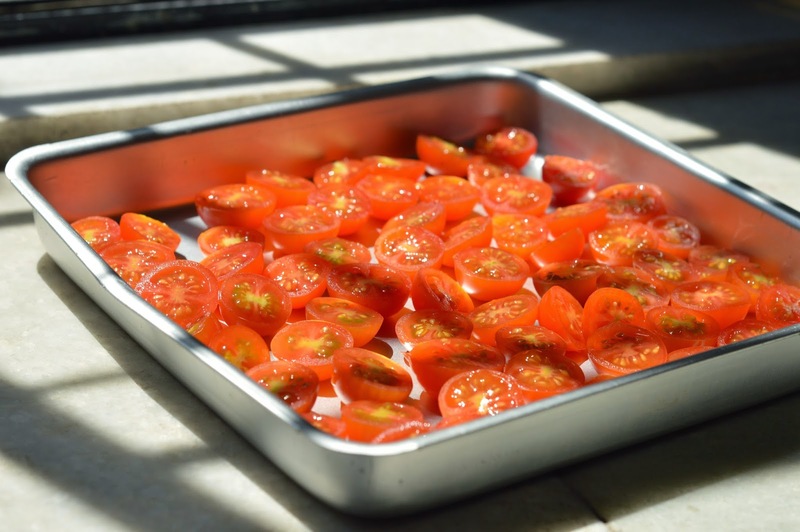 Pour good quality extra virgin olive oil onto the tomatoes till they are submerged. Do NOT use pomace oil. Tap gently to release any trapped air bubbles. Shut the jar tight and leave to mature for a couple of weeks. 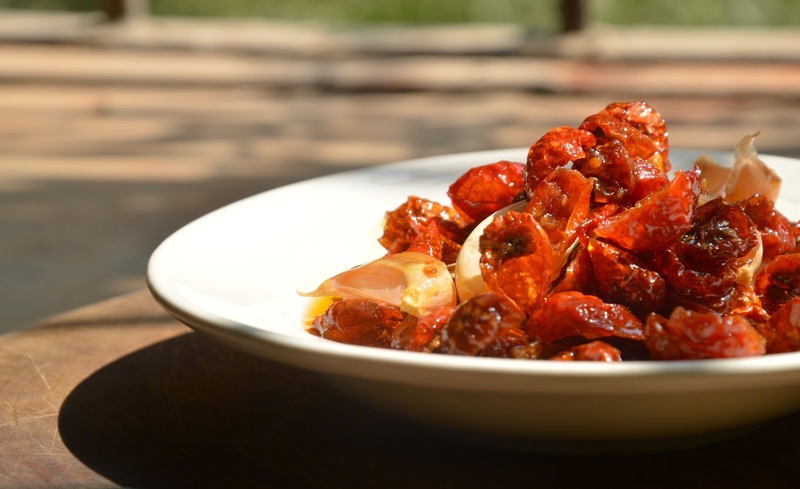 Sun dried tomatoes are a fabulous ingredient to have at hand. Use them in salads, add them to your bread dough, top on pizza, add them to a pasta sauce, make pesto with them... just go mad! I never knew these were so easy to make..